I am skeptical by nature, especially when it comes to supplements. It’s not that I don’t believe that alternative treatments work — my dog benefited greatly from acupuncture — but I am hesitant to give my dog a supplement that hasn’t been backed up by research. I worry about side effects, medication interactions and plain old effectiveness. If it doesn’t work, I don’t see the point. So when a friend suggested that I try turmeric for my dog’s arthritis, I tried not to roll my eyes. I wanted to help my dog’s arthritis, not season her with a cooking spice. To my surprise, a little research revealed that there might be something to my friend’s suggestion after all. The active ingredient in turmeric is curcumin. It is what makes the spice yellow and also what gives the tasty spice its health benefits. Curcumin has the potential to combat a variety of health issues. So far, studies have mostly been in vitro, aka in a petri dish, which means that a lot more research needs to be done before we can conclusively say that it works. But people (and now people’s pets) aren’t waiting for studies to tell them what they already know is true — turmeric helps ease the symptoms of a lot of health issues. So how can turmeric possibly help your pup? Turns out, there are quite a few ways. Curcumin has potent anti-inflammatory effects. Since inflammation is associated with arthritis pain, this could mean that turmeric for dogs could help with arthritis. Quite a few studies have shown that turmeric helps manage osteoarthritis in people and can reduce the symptoms of osteoarthritis. More important, preliminary studies suggest the same benefits could also exist for dogs. Curcumin has shown promise as an anticancer compound in dogs. As far as I am concerned, anything that can help fight cancer is worth a try. Curcumin may decrease pain in people at higher doses, kind of like ibuprofen. So far, no studies have come out about the effects of curcumin on pain in dogs, but this is still promising for pets. Some evidence suggests that curcumin may decrease blood pressure, but more research is needed to confirm this. Turmeric could help slow some of the effects of aging on the brain thanks to the antioxidants in curcumin. Curcumin could help fight liver disease and increase digestive functionality, helping with inflammatory bowel diseases and digestion. Curcumin is not absorbed very well by human and animal bodies, which means that you would need to give your dog a relatively high dosage of curcumin for it to have an effect. Pairing it with piperine, a black pepper extract, can help increase the absorption, but I was worried about the dosage level and what effects that might have on my dog. There isn’t a lot of information available about turmeric’s side effects, but it can be assumed that dogs may experience some of the same side effects that people taking turmeric supplements may experience. Turmeric could possibly cause stomach upset, blood thinning and diarrhea, and it could potentially cause a drug interaction with other herbs or medications. How much turmeric should you give your dog? Sprinkling turmeric on your dog’s food is probably not the best way to go. If you want to try giving turmeric as a supplement for your dog, put down the spice jar and pick up the phone. 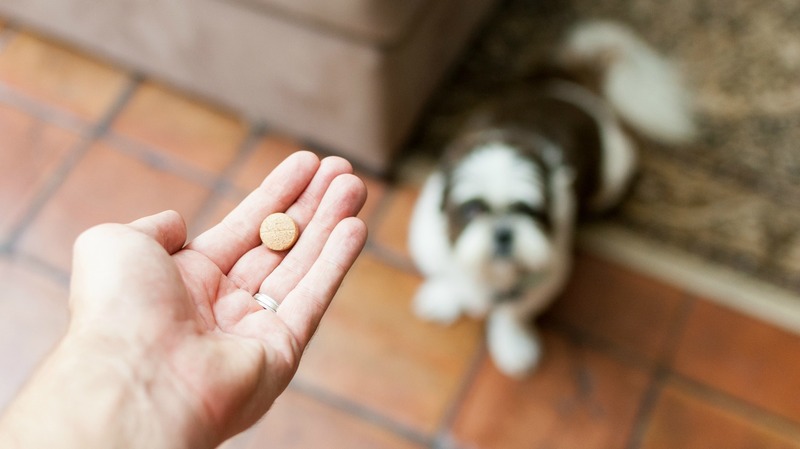 Talk to your vet or find a holistic vet who can help you find the right dosage and supplement brand for your dog, and make sure that your dog actually has a condition like osteoarthritis before you start treating them on your own. More: Pets and supplements: Hyped up or helpful? So will I try turmeric for my dog? I haven’t decided, but I plan to bring it up with my vet at my dog’s next visit. Since I am not a vet, here is my turmeric disclaimer: Supplements like turmeric might help your dog, but they are not a replacement for veterinary care. Your dog is like curry — a little turmeric adds flavor, but the curry needs a lot more than spice to make it tasty.